How to have a lot of tones, from just only one pickup and two potentiometers, like in some jazz, hollow-body guitars, Gibson Melody Maker or Fender Esquire? 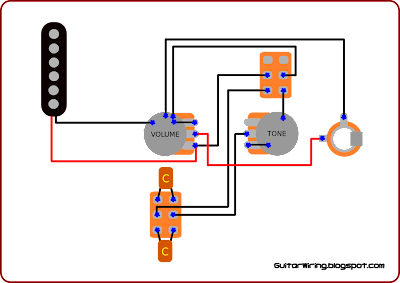 The switch beside the tone pot, is used to be able to switch off all tone control (the potentiometer, caps and their grounding). It will give a guitar tone with less impact of these electronics. The switch beside the volume pot, can be used to select one of two tone capacitors, which are parts of tone control circuit, so we can select a signal frequency cutoff level. It's good to use some typical and some lower value capacitors (for example: 0,022uF and 0,01uF).